L’Oréal is a leading global beauty-care company: “For more than a century, L’Oréal has devoted itself solely to one business: beauty. It is a business rich in meaning, as it enables all individuals to express their personalities, gain self-confidence, and open up to others. L’Oréal has set itself the mission of offering all women and men worldwide the best of cosmetics innovation in terms of quality, efficacy, and safety. It pursues this goal by meeting the infinite diversity of beauty needs and desires all over the world.” The firm’s annual sales are nearly $30 billion worldwide. Among L’Oréal’s leading brands are L’Oréal Paris, Lancôme Paris, Giorgio Armani Beauty, Yves Saint Laurent Beauty, Ralph Lauren Fragrances, Maybelline, Cacherel, and Garnier. According to the firm’s 2013 annual report, these are its top cosmetics markets as forecast for the year 2025. L’oreal is putting a chokehold on the global makeup market. With the new acquisition in the Asian market they have a sales base of over a billion people in china alone. With annual sales of over 30 billion worldwide it’s a good market to have cornered. Cosmetic industry is very unique, from my point of view, it has to develop directed by different needs of consumers from different parts of world. For instance, in southern parts of China, consumer prefers the powder or primer which is water proof because of the weather condition is extremely wet. But for the northern parts of China, people tend to choose the product which is moist. To be honest, I am very surprised that Europe is not one of L’Oreal’s top cosmetic market considering it is a French company. However, as one of the top beauty brands, L’Oreal understands its other top markets well. The differing views about the essence of beauty is what drives people of various cultures to purchase different beauty products. “Skincare is to China what makeup is to the US”. Understanding this major difference is essential as this means the product mix in China must be slightly different to what L’Oreal would offer to its customers in US. As a Singapore citizen (Singapore’s population consists of 70% Chinese race), I affirm that skincare products are considered more of a necessity than make-up as the natural radiance of the skin is valued over make-up. Understanding this difference means L’Oreal is equipped with the knowledge to compete with other popular cosmetic brands in Asia such as Missha (South Korea), Skinfood (South Korea) and Body Shop (UK). Sorry for the confusion. Europe is a top market today. The chart is a forecast for 2025. Thanks for posting. It’s a great article about L’Oreal’s successful business model in China. L’Oreal in china grows very quickly in recent years because it firstly recognized the trend of customers and then introduced multiple brands into market to satisfy different needs of customers. According to survey, an increasing number of Chinese people now, either women or men, are willing to pay at least one fifth of their income on beauty. Also, most of them believe mask is the best way for skin hydration, brightening and cleaning. L’Oreal’ realized the needs of Chinese customers so that marketed a professional mask brand-MG. It also designed both skincare- and cosmetics- oriented brands to target more customers. For example, it developed Lancôme Paris as an upper-level skincare brand while Maybelline is introduced for general level cosmetics use. As the economic developing in China in the recently few decades, more and more Chinese consumers, especially in urban area, are willing to spend more on beauty care products and that lead the primary demand growing constantly and believed to much more greater in future. On the other hand, domestic products in China are considered as low end and cheap products that lack on effectiveness and reputation and its hard to compete with the foreign brand in the high end market. Therefore, Companies such as P&G, L’oreal, and Estee Lauder are both gradually increase their investment in the Chinese market. In China, it is very important for a foreign enterprise which recognized the trend of customers under local culture. With the concern of business and geographic environment, now Chinese customers are paying more attention on beauty stuff, no matter protect skin or try to make themselves look energetic. . L’Oreal’ realized the needs of Chinese customers so that marketed a professional mask brand-MG. What’s more, it has several sub-brand which has different positions on different groups of customers. L’Oreal men is one of the most successful product series in China now. “If you are a beauty company, you need to have a Chinese skincare brand.” Since “Skincare is to China what makeup is to U.S.” L’Oreal teams up with MG in terms of its the new acquisition in the Asian market, which means they already have a sales base of over a billion people in china alone. L’Oreal understands Chinese customers’ need and differentiates the product they launched in China and America. In China, skincare products are considered more of a necessity than make-up as the natural radiance of the skin so that Chinese people are willing pay whatever they feel worthy on skincare products. Whereas American see more value on makeup. L’Oreal is certainly taking advantage of China’s tremendous economic growth. Without a doubt, the company has done its research and understands the importance of skincare for people in China. Selling the same L’Oreal products that people in the United States or Europe use would not result in the same reaction and success in China. In the United States, where makeup is treated as a necessity, L’Oreal knew to create a beauty, makeup line. However, “skincare is to China what makeup is to U.S.”, so to achieve positive results in the Chinese market, L’Oreal knew to concentrate on skincare. They made sure to analyze the Chinese culture before they entered the new market which is exactly what they had to do. In getting more involved in the Chinese market, L’Oréal is setting a good example for other businesses not only in taking advantage of the growing market, but also in making changes in order to satisfy the diverse desires and needs that exist worldwide. 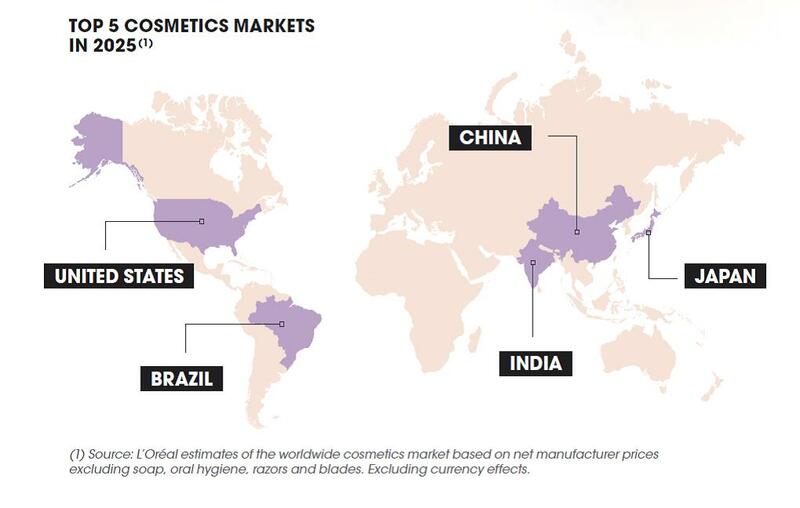 As shown on the map, L’Oréal’s top cosmetic markets forecasted for 2025 (U.S., Brazil, China, India, and Japan) demonstrate it’s success in appealing to people in various parts of the world. For China specifically, L’Oréal has recognized the importance of skincare and has taken steps towards incorporating these products into the brand and expanding. This is actually really interesting and something I’m learning first hand! At my internship my company represents many beauty, lifestyle and makeup companies. However, every few months they lose a couple of clients because the client company has been bought by L’Oreal. The company has grown a lot and keeps expanding very rapidly. Since it is such a big corporation, they obviously use their own in-house marketing/PR teams and don’t outsource this to another firm. Asian markets are a huge target for all types of companies nowadays. They are the ideal consumer and spend a lot of time and money in stores. I think L’Oreal’s marketing segmentation is very successful. It has different brands, which target different groups. Cosmetic is not only for women anymore, L’Oreal found out that men also want to leave great expression on others through the first expression, so cosmetics for men are developed and launched. China, as the biggest market for anything, is also found by L’Oreal. L‘Oreal’s acquisition of MG is a great step because MG is already become a famous mask brand in China. Now the sales increase for L’Oreal in China is not that fast as the beginning, so this acquisition could help it occupy a new area and boost it sales. I did not know how more important skin care is in China in relation to the US. It’s sad to say however, I do think Americans spend more time and money on make-up and covering up skin care problems than they do on taking care of their skin. L’Oreal is making a smart move investing more in their Chinese markets. Every company should have operations in China because of the vast amount of opportunities for growth there. I’m surprised that L’Oreal doesn’t have a strong foothold in the Chinese market till now. It’s great to see L’Oreal make great investment in such a big market. And with the ever growing demand in the Chinese market for luxury and expensive brands, over time L’Oreal could really benefit from introducing more expensive lines there. I strongly agree that “skincare to China what make up is to the US”. This is not only the truth in China but also in many other countries in Asia, such as Japan, Korean, and Singapore. I was thinking about since L’Oreal has already notice the different consumer needs in different countries, they may want to try to develop more skincare products in Asia market, and introduce more makeup brands in the US market at the same time. It refers to both globalization and localization. It is true that Chinese consumers pay more attention on the skincare products than makeup. this may be influenced by Chinese traditional culture and consumer behavior. That is also the reason why Revlon has to leave China in 2014. Revlon does not really understand what the Chinese consumers want. But L’Oreal made right decision to acquire the MG mask which is the most popular mask brand and liked by young people. In china, Lancôme stands for the high price products. L’Oreal Paris is middle-price. After add MG, this company can reach young consumers with middle-lower income. This strategy fits the Chinese cosmetic market place.